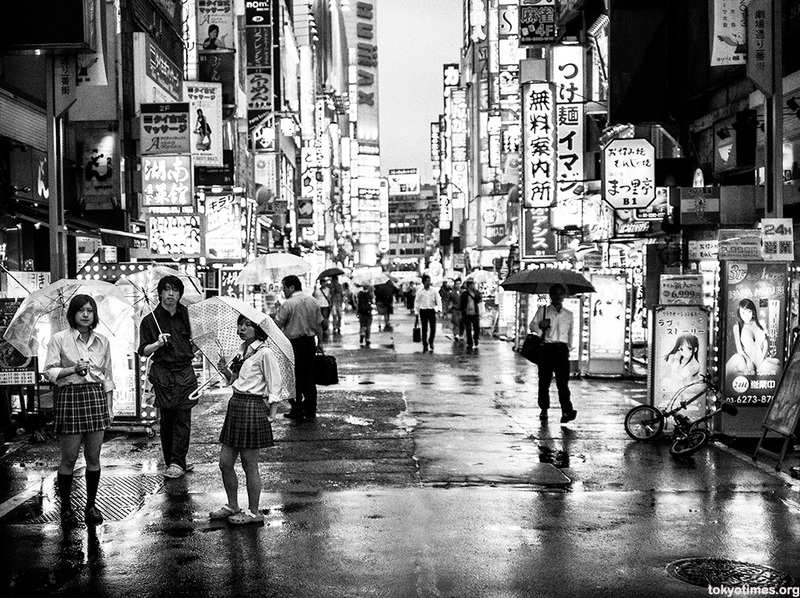 Kabukicho, Tokyo’s famous red light district, has been going through some changes of late. Huge redevelopment has left the place in danger of losing part of its character (like this wonderfully retro strip joint), and a city government crackdown has attempted to clean up some of the nefarious activities the area is known for. Not that you’d necessarily notice when walking around. It’s still dirty. Dotted with dingy alleys. Plus densely populated by hostesses and touts. However, a newly announced ban on street solicitation could well make a difference, as the sheer number of the latter out on the streets do, for better or worse, contribute to the district’s personality. Of course how strictly the new regulations will be enforced remains to be seen, but it’s at least possible that these school girl uniforms won’t be on show — at least in public — for very much longer. If the gov’t is really determined to crack down on the solicitations, they merely need to send in a former coworker of mine who, after taking upon himself the noble task of consuming all the alcohol in Tokyo, would chase the girls on the street corners of Kabukicho while shouting out “Watashiwa Scooter-san desu!” No, his name was not Scooter, and yes, that’s pretty garbled, but give him a break: he was very slightly inebriated. Anyway, suffice to say, the girls would all run screaming each time he made an appearance. Which was every other hour as he would stumble around from one street to the next. Man, I miss him. He was such a happy drunk. Scooter-san could well be the answer. Providing his health has held up of course. Must have been quite a sight though. He was only 26…which, holy crap, makes him 36 now! And that means I’m… No, we won’t go there. Anyway, he’s a bit more sober these days, thankfully! I remember being accosted here once when I was out with my son. They implored that “Foreigner OK”. We dashed down to Dubliner’s instead for a pint and a laugh! When I first arrived It was quite rare to be propositioned — if it all to be honest. Nowadays, however, it’s a very different story, as even just a brief walk round generally results in all sorts of kind and intriguing offers. This is a great shot with the lights and the rain and especially the brollies. You better earmark it, as you are right and this is a disappearing scene soon the be published in a collection of fond memories of Kabukicho. The yakuza and crime will move elsewhere, maybe spread out a little which will make it more difficult to control, so I’m wondering why the Tokyo Council is even bothering cracking down on Kabukicho. On a completely different subject, why are the girls wearing Crocs so often in Kabukicho? I noticed that when I went through this area last year, I noticed then now again on one of the “schoolgirls.” Must be practical in their job but even normal Japanese shoes are made to slip in and slip out quickly. That’s a very good point. It’s an industry that isn’t going to disappear, that’s for sure. Not as though it is just restricted to Kabukicho either. I think a lot of it goes back to Ishihara. He decided to wage war on the are when he became governor, so presumably it’s continuation of that. Maybe the Crocs were an Ishihara policy too, as I honestly can’t think of another explanation! Good call. Hadn’t thought of it like that. I’d only seen it as some sort of puritanical mission on his part. A real conflict of interests! Truly shocking that they got away with having it removed, but reassuring that doing so caused such public outcry. What a great shot. The B&W really adds to the dirty feeling. Its one of my regrets that i’ve never walked through this area on my visits to Tokyo, and it now sounds like I may have missed my chance. I don’t know. Kabukicho being Kabukicho, I’m sure it’ll find a way any regulations that do come into play. Are the girls working there generally Nihonjin, or imports ? The ones you see out on the streets drumming up trade are, from appearances at least, generally Japanese.